Rien ne Dit has gone from being a helpless baby to a demanding toddler. In June 2015 he listened to gospel singer Niel Higgins on the final day before Niel and his young wife emigrated permanently to America. Rien ne Dit was interested in playing the Ukulele but could not quite work out how. Nothing to say. A statement. The name of a baby boy. An echo of despair that stretches from the eyes to the toes, of his mother. A woman who seems to have forgotten how to smile. 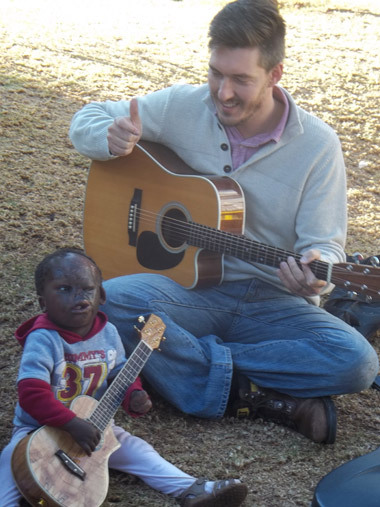 Rien ne Dit was born one month premature in July 2013, to his poverty-stricken mother Tantine Mbembo (30). Then, at only six days old, the kerosene lamp fell and the flaming fuel poured over the baby's miniature face. Nothing to say. The child's father Fiston Kasango (33) had nothing to say. How could God be so cruel to create calamity upon calamity for a couple just hoping for a perfect son? 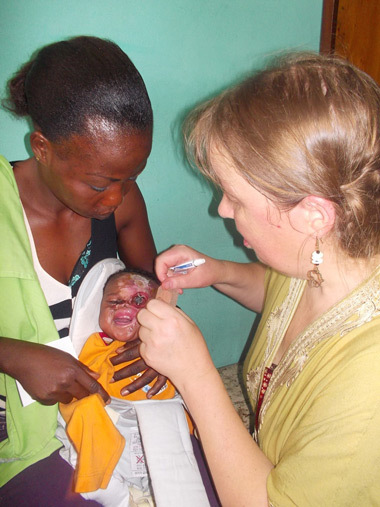 They poured water over the infant's face and then rushed the baby boy to the General Hospital in Kinshasa, DRC. He stayed there for two months. A baby burnt before he was even meant to be born. One cannot even comprehend how the family found the money to cover the hospital stay. Nothing to say. Nothing for free. How can people in countries with state healthcare understand the plight of a terribly-burned infant when there is no money? The fate of injured children in Africa lies in the hands of God alone because healthcare is not there. Rien ne Dit has a massive bulbous left eye. Inflamed with eyelids pulled back into nothing. Maybe there is some vision to preserve. We have seen awful eye injuries before. With topical lubricants, topical antibiotics and effective cover, there is always hope. But only if medication is provided daily. And the baby is well-nourished. And his other health protected in every way. Rien ne Dit has lost his nose. He still has small open wounds upon what is left of his forehead. His lips are damaged but still he can suckle milk from his mother. What hope is there? For his tiny damaged left hand? The fingers curled inside it. What hope is there for him to survive at all? For him to receive a new name? All I could say when I met him, was: Get a passport. A passport in the Congo is US$200-250. Two passports (if one anticipates the mother travelling) is double. Everywhere compassion is contracting like the fragile skin on his wounds. A two-pronged approach is to beat the indifferent bureaucrats for documents, and at the same time to find hearts somewhere, that are still open. Beaucoup de dit. I have lots to say. Each word must count. It must be in the language that unlocks doors. Words of the soul. If pleas have to be in French, Italian, English even German they also have to acknowledge an emotionally-fatigued world. A surge of tears. Of panic. Of knowing the Everest of emotion because I have done this before. Praying for stamina to reach the medical summit that the little boy does not know he needs to climb. Because Rien ne dit is too young to speak, to think.